This classic dishwashing liquid is designed to have mild, long-lasting suds for a more thorough clean. 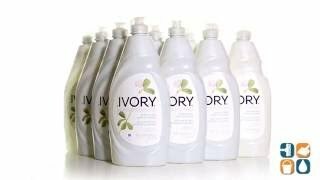 Although it is a considered a mild dishwashing liquid, Ivory handles a broad range of dish soils. This Ivory Dish Soap effectively cleans your dishes and leaves a clean, pleasant scent. Great for use in residential or commercial kitchens. Order Ivory Dishwashing Liquid today and save. Buy in bulk quantities for your business and save even more!